(SPOT.ph) Often, when local showbiz finds something that works, the tendency is to stick with it until they run out of love songs to turn into movie and teleserye titles. Some eternal love teams, like John Lloyd Cruz and Bea Alonzo, have withstood the test of time. Occasionally, showbiz does a little mix-and-match, which has given us unlikely but loveable gems like JLC and Sarah Geronimo. And then there are these 10 pairings; they might sound unthinkable now but yes, they really happened. 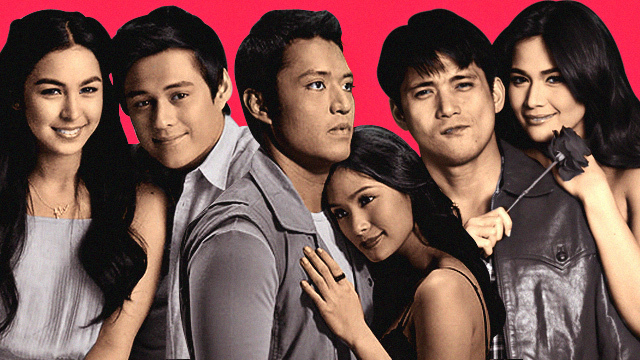 Before the public fell in love with LizQuen, Enrique Gil was paired with a whopping five leading ladies. In 2014, he starred alongside Julia Barretto in the short-lived fantaserye, Mirabella. (It's also rather unfortunate that Barretto's first starring role involved terrible CGI that literally gave her a wooden complexion.) The show ended after just four months; Gil moved on to Liza Soberano, while Barretto was paired with Inigo Pascual—although that didn't last very long, either. If you think this match makes zero sense, wait until you hear the cringe-worthy plot of their movie trilogy. (Yes, people liked their pairing enough to warrant three consecutive movies.) The two play orphans, Pido and Dida, who believed themselves to be siblings until they discover that they aren't actually related. They immediately become lovers as though all this time, they've been painfully holding back their incestual feelings for each other. Sure, anything usually goes in comedies but in this case, you just can't help but feel really uncomfortable. Nowadays, we associate Alden Richards with Maine Mendoza but in 2014, he had a very different leading lady. A then-relatively unknown Richards was cast as the charming love interest to Marian Rivera, who was seven or eight years his senior. The show, which also featured a star-studded cast, portrayed beauty as a curse for women rather than a blessing. Sadly, their pairing didn't pan out and the show was axed after just four months on air. D'Anothers was a fresh-faced Toni Gonzaga's first movie under Star Cinema after she transferred networks in 2005. A few years later, she was reunited with Vhong Navarro in a romance film directed by Cathy Garcia-Molina—yes, distracting wigs included. Although their tandem never quite blossomed beyond the two movies, they at least remained good friends over the years. If this project doesn't quite ring a bell, we don't blame you. This musical drama only lasted three months but to its credit, it boasted a star-studded cast (including Maja Salvador, Cherry Pie Picache, and Joel Torre) and even spawned an original soundtrack. The story gave room for both Jericho Rosales and Sarah Geronimo to flaunt their singing talents, but they never got a chance to flaunt whatever chemistry they may have had after the show ended. Robin Padilla has a long list of leading ladies, including Bela Padilla (no relation, don't worry), Mariel Rodriguez, Regine Velasquez, and Judy Ann Santos. While the latter two pairings worked quite well, his team-up with Bea Alonzo wasn't as lucky. In the series, Padilla played a former cop-turned-vigilante, while Alonzo was a beautiful artist pining for the love she lost in a tragic shoot-out. You know, typical action-drama stuff. You can bet the costume department had a lot of leather jackets, too. The Reunion was a teen dramedy film that featured an ensemble cast of young, up-and-coming celebrities. In 2012, Xian Lim was yet to be paired with his off-screen lady love, Kim Chiu, while Megan Young had yet to win Miss World. Although they looked pretty good side-by-side, their love team didn't quite take off. Hey, at least they have a recent Kopiko commercial together. Former Gwapings (remember them?) member Mark Anthony Fernandez has GMA 7 to thank for the string of leading roles in the late 2000s. One of them was Luna Mystika, where he played the childhood sweetheart to Heart Evangelista's mystical Luna. There was a lot of magic involved, but basically Luna had an evil (and more attractive) twin shadow that was out to ruin her life. Their onscreen romance didn't last very long, but the shtick got a Round 2 with a sequel, Luna Bianca, several years later. Gabby Concepcion's body of work isn't new to romancing women much younger than him. (2009's When The Love Is Gone, 2015's Because of You, and 2012's Kahit Puso'y Masugatan, just to name a few). If his age gap with leading lady Angelica Panganiban were a person, it would be a fully fledged 23-year-old adult that can drink, drive, and go to work. Although they were never paired in another project, at least Concepcion still has that May-December thing going for him. Fun fact: John Prats was Maja Salvador's first leading man when she started out in showbiz. Although their love team was largely overshadowed by JLC and Bea in the 2003 series, they reunited over the years on the ASAP dance floor. Over a decade later, they finally got an actual project in the currently airing drama, Ang Probinsyano. Sadly, they didn't last; Salvador eventually left the show, while Prats stayed on to keep shooting the bad guys.